They say a picture is worth a thousand words. Well these pictures are worth about two thousand. 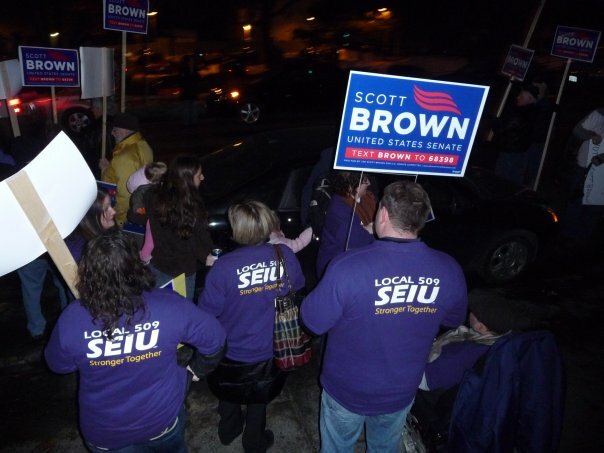 If SEIU's rank and file members are supporting Scott Brown, then I don't think we should expect too much help from them on Tuesday. Actually this kind of reminds me of the New Jersey governor's race. 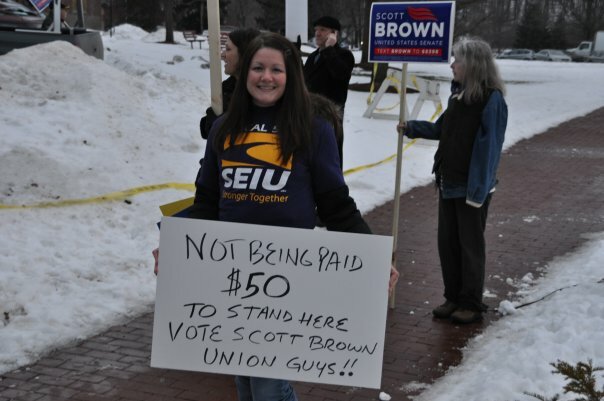 Corzine had all these union people who were suppose to be out there for him on election day. They did show up, but they clearly could not match the enthusiasm of those on the right. It almost seemed like the union guys were only going through the motions rather than actually trying to get out the vote. With a bit of luck, maybe the same will happen in Massachusetts. Great pictures of a crazy campaign. Down is up and up is down and a Republican may be the next Senator from the People's Republic of Massachusetts. Cliff got this up before all the big media. Great job. The peoples' Republic .... let's see if they remember. I'm betting they will. seriously...this has me so excited...on the edge of the seat....watching through hands over eyes and peaking between fingers.....tell me when it is over and the good guy wins! This is just a little proof of the paradigm shift that is coming. Traditional America is reasserting herself! I do try to find the goodies! Have you ever been to Boston and walked the Freedom Trail? It would seem almost impossible for Mass voters to forget who they are. I too have same sense of excitement. 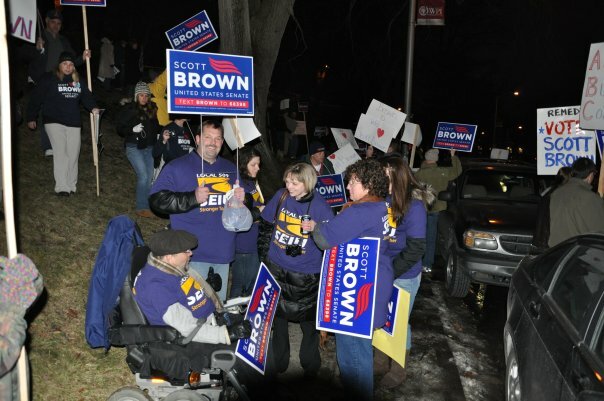 We want Brown to win so bad, we are almost afraid to say it out loud for fear we may jinx it. It is going to be pure torture on Tuesday. I think it is safe to say those purple shirts are turning Red White and Blue. great post. I am one who is really hoping that Scott Brown wins. Love the photos too. I think that American pride is returning, and the democrats have no idea it is happening.